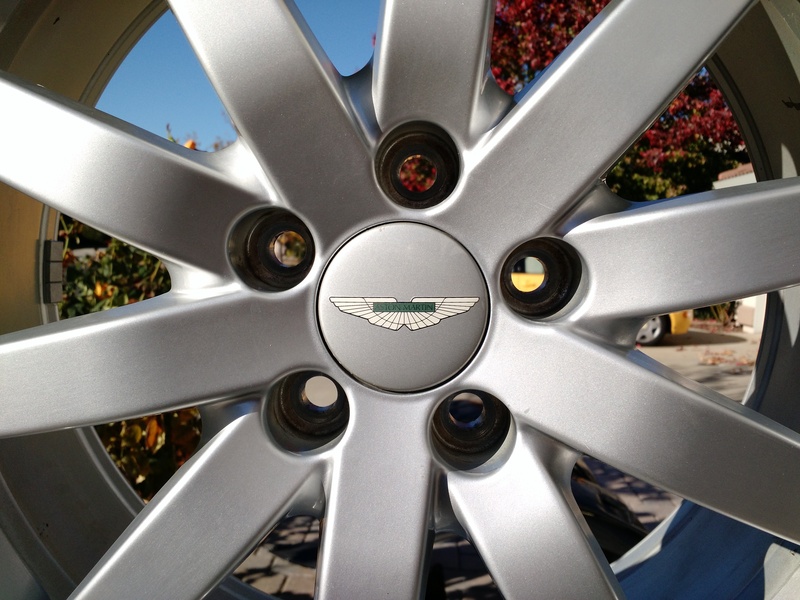 The tires on your DB9 will need replaced eventually. You either put enough miles on them that they wear out, or if they get old enough the rubber breaks down and it becomes a safety issue. I’ve written a bunch about tire before, including how to inspect them for wear or age (check out the article here). When the time comes to replace them, the question usually arises “with what”. A few pieces of good news here. We have options and they aren’t insanely expensive. I’ve changed the tires twice on my 2005 DB9 so far. 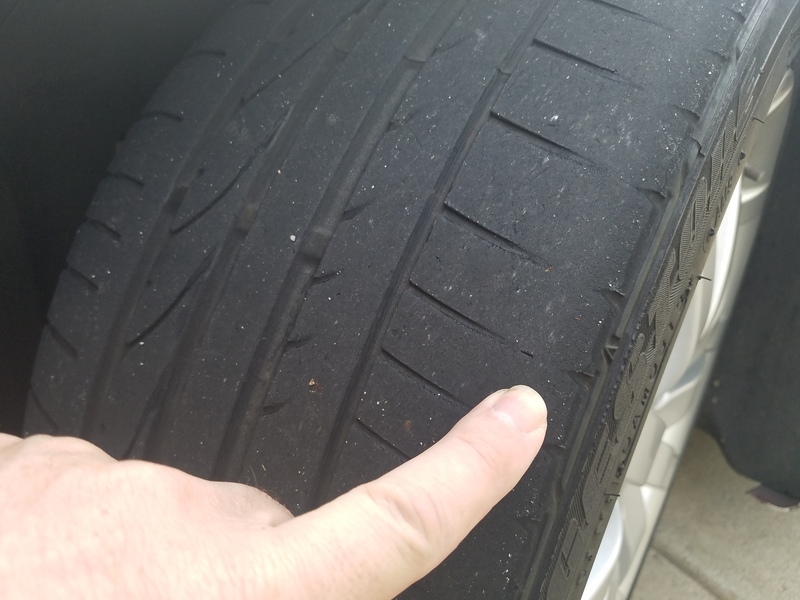 When I purchased the car in 2013 it still had the original factory shipped Bridgestone with a 2004 date code, they were 9 years old and cracking. I replaced them with a new set of the same Bridgestone tires. Fast forward 15,000 miles and 4 years and I’d worn those out, and figured I’d try a set of the Michelin Pilot Sport 4S. When I looked into the options, here is what I learned…. Note: You should do your own research to confirm the correct tires for your car. I haven’t looked at the details on late model DB9’s. They may be the same, just double check. Let’s nail down a few details first. What size and rating of tires are standard? While you can find this in several places, one easy to access place is your Owners Manual page 13.6. The 235 and 275 refer to the width of the tires in mm (generally speaking). The width of the tire is carefully designed to go with the width of the rim, and to clear the fenders and other wheel well obstacles. Stuffing larger than original tires onto the car can lead to problems if you aren’t careful. The 40 or 35 is the aspect ratio and generally refers to the height of the sidewall. Lower profile tires have lower numbers. You don’t want to put on lower sidewall tires without considering that you might be altering the overall external diameter of the tire. Doing so can alter the accuracy of your speedometer, ride quality and other matters. ZR means a radial tire of Z speed rating. But, it only means the tire is rated for speeds above 149 mph, but not specifically what maximum speed. It’s an old standard. When cars started to go even faster than 150 mph they defined even more ratings, like Y described below that apply to the DB9. 19 is the diameter of the rim in inches. Someone trying to customize their car might increase their rim size to 20″ (cruz’in on 20’s), and then opt for a lower profile tires (25 series perhaps) to reduce the sidewall height and keep the overall diameter of the tire the same. Y is the speed rating, the sustained speed the manufacturer of the tire says the tire will endure. The Y speed rating means 186+ mph (300 kph), which is good since our cars top out at 185 mph supposedly. 92 and 96 are the load rating, the ‘weight’ the tire can carry at certain pressures and speeds. Our cars weigh almost 4000 pounds total with near perfect 50/50 weight distribution front/rear, so that means each tires is carrying about 1,000 pounds. The Owners manual spells out a minimum load rating of 1,389 lbs (630 kg) Front and 1,565 lbs (710 kg) Rear. A ’92’ rating is 1,389 pounds. Whew. That’s a lot of boring but important background. Now that we know exactly what we are shopping for, what are our actual options? One thing I am sure of is that all tires are NOT the same. You can put the wrong tires onto a car and total mess with the ‘feel’ of the car. By simply buying the cheapest possible tire you can make your next 4+ years with the car less pleasurable. Presumably you don’t want to make that mistake with your DB9, that’s why you’re reading this boring blog. I live in the United States so my options may be different that what you can track down in your country. 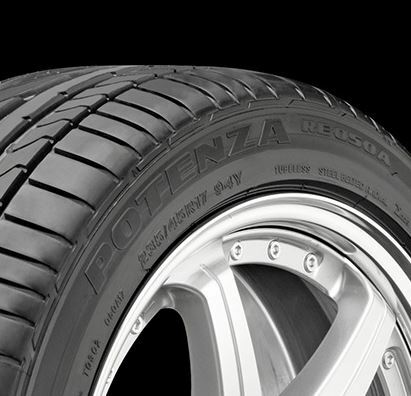 The Bridgestone Potenza RE050A was the original tire fitted to the car when it left the factory in Gaydon. This is the ‘safe bet’. 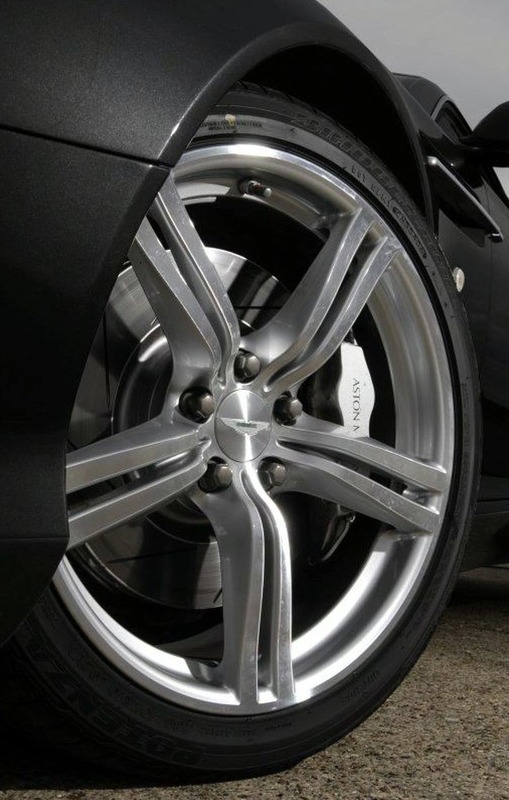 You know the Aston Martin engineers worked closely with Bridgestone to marry the suspension characteristics with the tires characteristics to provide just the right balance between handling, noise and comfort. If you’ve never driven on these in your car (perhaps you purchased it used and it was fitted with alternatives), I suggest you spend a few years on a set to know what the car was always meant to be like before you choose a tire from some other maker. You will not be disappointed, the Bridgestone is a very good tire. 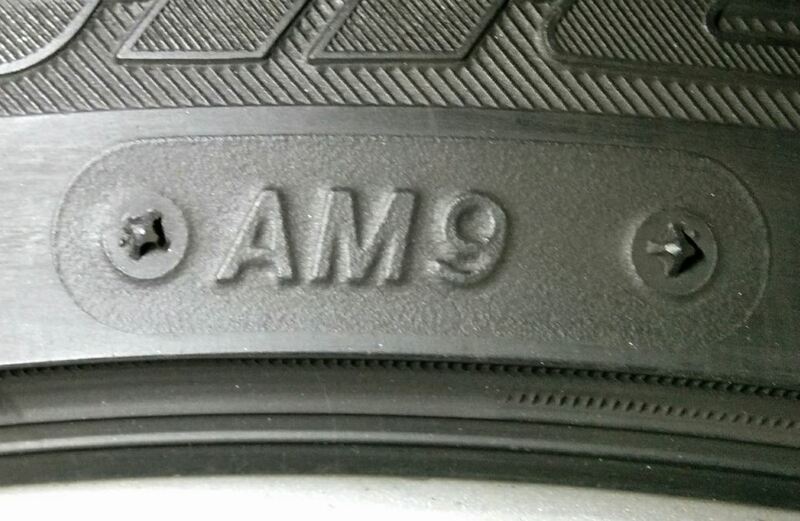 Once nice touch about buying this tire, it even has an Aston Martin stamp of approval on the sidewall. The AM9 seen in this photo on my car shows this. All total you are looking at $1,152 plus tax and shipping. Plus you’ll need to get them mounted and balanced by an installer. They list a bunch more nerdy information for the tire, including how many revolutions it will make per mile (so you could calibrate your speedometer). I checked out what a lot of others were doing on the PistonHead, 6Speedonline and AMOC forums. 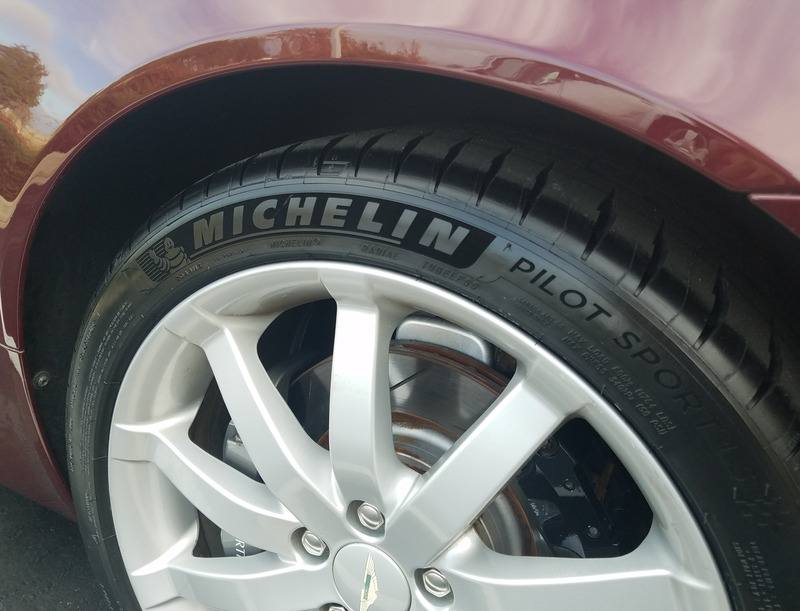 Many other owners had great things to say about the Michelin Pilot Sport 4S. [Keep in mind this is NOT the Michelin Pilot Sport Cup 2 – their ultra sticky performance tire]. This tire is more performance oriented than the OEM Bridgestone. I put a set of these on three months ago, and have some initial perceptions comparing them to the OEM Bridgestones. They are grippy’er. I’ve been to one AMOC Track Day on them already, and found them to hold better in the corners, squeal less, and were very communicative and progressive as I reached the limit of grip. I like this about them. They are stiffer. I feel like the car is a little less supple than it used to be, and it could be the sidewall of these tires is stiffer. Not a huge change, but definitely stiffer than softer. They are very slightly louder. When cruising at highway speeds I think I can hear them a bit more. I could be wrong. It’s nothing to worry about. All total you are looking at $1,168 plus tax and shipping (plus getting them mounted and balanced). Near as makes no difference the same cost as the Bridgestone’s. 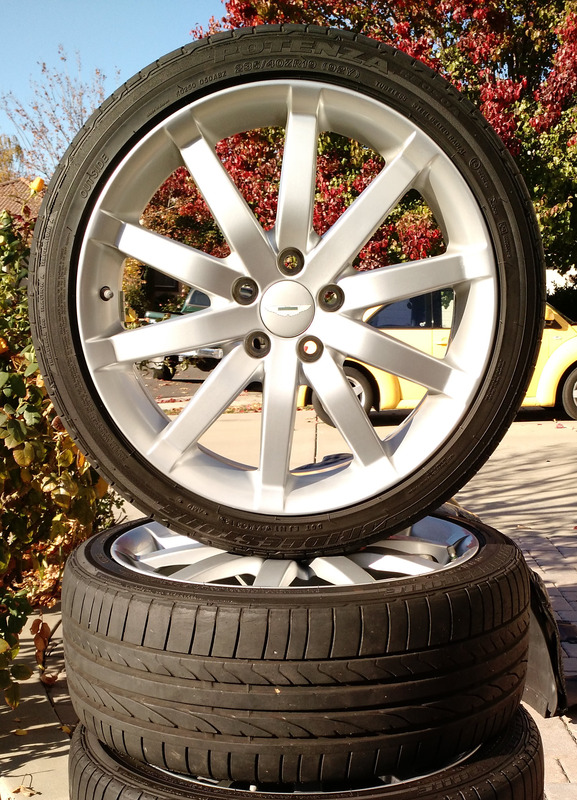 The Michelins are Y speed rated (same as the Bridgestone’s) but have a higher load rating (96 front and 100 rear). All good stuff. These tires are also about three (3) pounds lighter each. That’s a significant amount if you are performance oriented. Lowering the ‘in-sprung’ weight of the car is a big deal, and dropping 10% off the tires weight is great! This leads to better acceleration, braking and handling. All good! Here is the same nerdy information. Note the number of revolutions per mile is slightly lower (783 vs. 785) so in theory the speedo will be off a tiny bit, under reporting your speed by 0.3% (not that will even be 1 mph at top speed). I decided I will only write up in detail tires that I’ve tried personally. But, there are more options out there that might be great. I’ve listed a few here that you might want to explore on your own (only ones that offer the exact right sizes and specs to meet or exceed the OEM tires). Better yet, if you’ve run these exact tires and have some comments to share, please leave them below and I might include them for others to benefit from. Essentially they are 10mm wider both front and rear than the standard DB9. If you’ve never driven on the original Bridgestone tire, I’d suggest you do this at least once. You get the quietest and probably the smoothest ride. 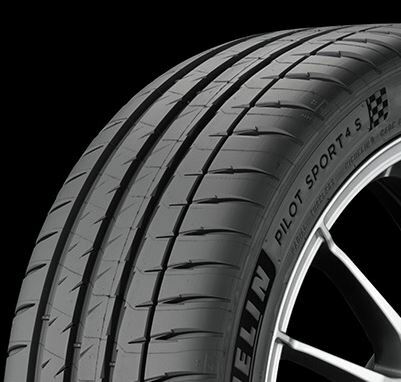 If you are looking for a sportier options, I’d suggest going for the Michelin Pilot Sport 4S in the Sport Pack sizes. With your choice made, check out my next article detailing the process of changing my tires out to the Michelin’s. I discuss the same materials in this video if you’d prefer to watch rather than read (or have me lull you to sleep). And when you are about to take your DB9 in for its new tires, what better way to give the old ones a send off with a being a little bit of a Hooligan …. Good timing, I just bought (last week) the Contis you mentioned, Sport Pack sizes, for under $800 + M/B and couldn’t be happier. If someone is looking to save a few bucks while not sacrificing much performance over the PS4s, I say go for it. I couldn’t be happier. Great to hear! Where did you track them down at such a good price? Just negotiated with a local dealer? Ha, yup, I was just on redpants prior… Anyway, eBay was running $100 off any purchase over $400 from Discount Tire Direct… made 2 separate purchases and viola, 4 tires delivered under $800, free shipping, no tax. Thanks again, your videos and posts are fantastic! Brilliant way to save a couple of hundred! Quick question. How are your PS4S’s going? I am due to change the original S001’s for my Rapide and interested on your thoughts 12months down the track. I don’t track the vehicle and hence looking for the best road tyre. Either S007 or PS4S. Hi Martin. I am loving them. I’d say go for it.